Rate a wack, slam down those mallets! Just what do those little rows of mallets mean? They may look small, but those tiny rows of mallets mean big, big things. A row of mallets appears directly below every wack experience you're reading. And those mallets are one of the most important parts of the Wacktrap site. The darkened amount of mallets you're seein' is that wack's current rating. But you haven't given your input yet. Just as sure as you'll want to read a wack, you'll want to rate it. Because you define just which wacks make it to the Wacktrap front page-spotlighted for the whole world to see. Simply, a Wack Rating is how users rate each others’ wacks. You’ll be able to rate every wack you read-or whichever wacks you choose. The more wack you think the experience is, the more mallets you’ll be givin’. At the end of every wack you read, you’ll find the option to slam down some mallets. It’s your way of doin’ justice. And your way of sayin’ just how good-or great-a wack really is. So how does Wack Ratings work-and how do you rate a wack? A small row of mallets allows you to rate just how ‘wack’ you believe a user’s experience really is. Some are good. Some are great. Some just are. Then there are those that are downright wack-and those are the ones you’ll be helping promote to the Wacktrap homepage-front and center where they belong. The more wack you think the experience is, the more mallets you’ll be highlightin'. If it’s outrageous you’ll be givin’ it a ‘5-mallet’ rating. Didn’t even make you crack a smile? ‘1-mallet’ it is. Smack in the middle: it’s not exceedin’ a ‘3’. Your ratings determine which wacks shine in the limelight. And other users’ ratings determine whether you, and your wacks, will be basking in all that glory. The mallets will first appear faded-until you to begin to scroll over the row with your mouse. Remember: the more wack it is, the further right you’ll be headin’. Every wack you read gives a rating option of a 5-mallet maximum. 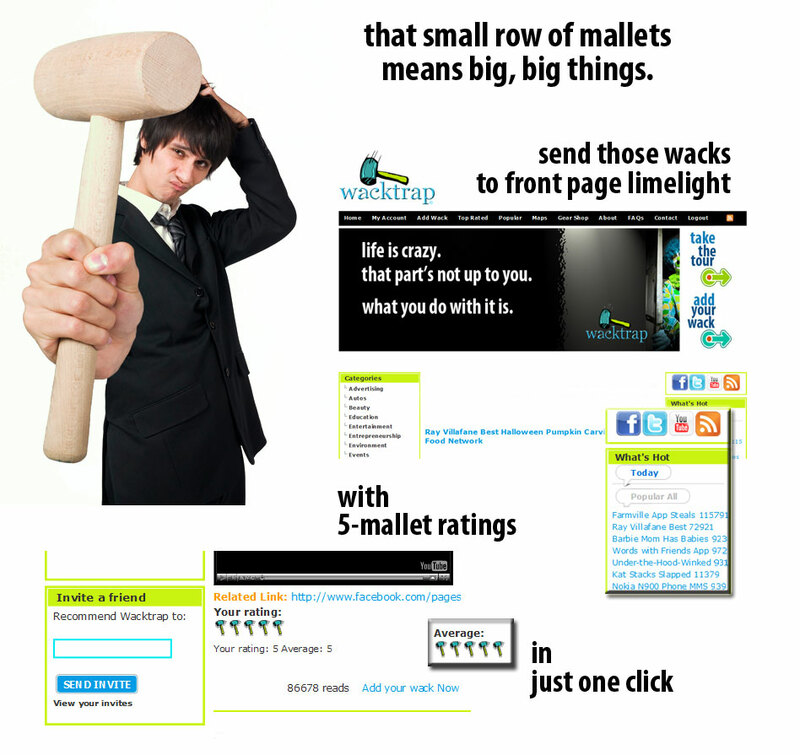 On the Wacktrap scale a ‘5-mallet’ rating represents the most wack experience, a ‘1-mallet’ rating the least wack. Mallets will darken as you scroll: the darkened number of mallets represents the Wack Rating you’re personally giving for that wack. The best of the best will be getting’ a ‘4’ or ‘5’, '5' representin' the highest 'wacktastic' rating. Make sure you don’t let go of that mouse or click until the number of mallets you want is darkened-click and release, your Wack Rating is in! When you've got questions, we've usually got answers: visit our FAQs section, the frequent stuff, where you'll find the scoop on Wacktrap and its features. Add your own wack, now! Comment on those wacks, now!